Yup’ik Elders admired this pair of Iñupiaq boots, which are similar to ones they remember from childhood. Oiled boots with waterproof stitching were needed for walking on the wet tundra in spring, summer, and fall. The maker of this pair used her teeth to soften the bearded sealskin soles and to shape the pleated toes and heels. Virginia Minock: They’re like rubber shoes. They are waterproof. Joan Hamilton: Kiagllainarmi-qaa aturlarait makut? Joan Hamilton: When weather is warm enough that there’s moisture, like in the fall. Ii-i [yes], when there’s liquid on the ground. Neva Rivers: Seal-auyugnarquq. Seal skin-auguq mana kavirluku tauten. The whole thing. Allakaunruuq. Joan Hamilton: Their sewing is different from our style. Neva Rivers: Mm-hmm. Makut natrallrit naug’ keggmarluki. Tangeqsaitua taugaam keggmarluki waten. Joan Hamilton: They use their teeth for this kind of crimping. (2) Assirpag [so nice]! Neva Rivers: See, maaggun stitch-arluki-ll’ qamaggun pimaut makut. Teguarit makut spread-asqevkenaki waten tam mingeqluki maa-i pillruit. Neva Rivers: Then when they’re dry enough, they put these on, sew it on to this one [vamp]. Aron Crowell: Is that alder dye? To make them that nice red color? Aron Crowell: And then to make them waterproof, you put oil, soak oil into them? Neva Rivers: Yes, they do it this way [gestures sewing technique]. Neva Rivers: That fastens them really good. And the thread has to be very tight. Neva Rivers: To make it waterproof. Joan Hamilton: This [drawstring at top of upper] is braided sinew. This [strap] is the same thing to keep these [boots] in place, and then up here [drawstring] too. John Phillip, Sr.: North-armiut tuaten piliilartut tamakunek. Neva Rivers: Qagkumiut tam waten natratuut. Aron Crowell: That particular pair, but you had similar waterproof boots? 1. An ivruciq—plural is ivrucit—is a “waterproof skin boot” (Jacobson 1984). 2. A teguaq—singular of teguat—is a “crimp in the sole of a skin boot.” A teguarun is a “device for crimping boot soles” (Jacobson 1984). 3. Rye beach grass refers to taperrnaq “coarse seashore grass” (Elymus mollis) (Jacobson 1984). 4. An egliq is a “welt seam on boot” (Jacobson 1984). A welt—often made from a narrow strip of skin—was stitched into seams of boot soles and uppers to make the seam waterproof. Smithsonian collector Edward W. Nelson purchased these waterproof sealskin boots at the trading post of St. Michael near the mouth of the Yukon River, but Yup’ik Elders suggested that they were made farther north, in Iñupiaq country. 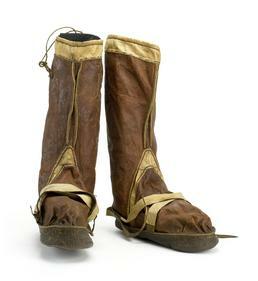 (1) Similar boots were used in the Yup’ik region for walking on soggy tundra during spring, summer, and fall. Elders observed that the maker of these boots used her teeth to shape the pleats, or crimps, on the toes and heels. Anthropologist Margaret Lantis, on Nunivak Island in 1939-40, learned: “Around Norton Sound an ′xtay was a person who had been ashamed to go home and had turned into a wandering spirit.